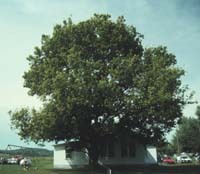 Box elder, also commonly known as ashleaf maple, Manitoba maple, box-elder maple, and western box-elder, is a small-to-medium-sized tree, reaching heights of 50 to 75 feet, with a trunk diameter up to 4 feet. The trunk is relatively short and tapering, and the crown is spreading and bushy. Box-elder has the broadest range of the North American Maples. It is present in every county in Illinois, reaching optimal growth along streams in floodplains where it occurs with other bottomland hardwoods. It extends from Canada to Guatemala (in the mountains), and from New York in the east to Florida, west to southern Texas, northwest across the great plains into Canada. Further west in Colorado and California it occurs on slopes, in valleys, and associated waterways. Box-elder and its seedlings grow on a variety of soils. Although it grows best on moist soils, box-elder is drought and cold resistant. It can also tolerate flooding for extended periods (up to a month). In bottomlands, it usually has a shallow root system that extends outward. This is an adaptation to unstable soils and the typically low oxygen content of flooded soils. Because of its thin bark, box-elder is susceptible to fire, ice, and wind damage. In southern Illinois bottomlands and in abandoned fields, box-elder is the most abundant species in the understory of cottonwood-willow stands. Seeds are produced yearly and in quantity. They ripen from August to October, and are shed continually from autumn to spring. This means that there will be a variety of soil conditions (dry to wet) and temperatures available for seedling development over an extended period of time, increasing the successful establishment of seedlings. Seeds do not require openings in the canopy to germinate. Seedlings will persist for 1 - 2 years in the understory. If a gap does not appear soon after this time, however, the seedlings will die off. Box-elder is a relatively short-lived tree, typically reaching 60 (rarely 100) years of age. It is fast growing when it is young (the first 15 - 20 years). Box-elder bark is light brown when young, but becomes grayish-brown and deeply grooved upon maturity. The twigs are bright green (rarely purplish), smooth, and shiny. These characteristics help to distinguish box-elder from ashes (Fraxinus), which also have pinnately compound leaves. Twigs usually have white lenticels (small openings or spongy areas in the cork surfaces that help gas exchanges between internal tissues and the atmosphere through the bark). Buds are small, 1/8 inch long, rounded white and woolly. The leaves are opposite, pinnately compound, and up to 6 inches long. There are 3-7 elliptic to oval, leaflets, which are 2 to 4 inches long. Each leaflet is shallowly and irregularly lobed or notched, green and smooth on the upper surface and paler on the underside. Box-elder is dioecious, with male and female flowers occurring separately, not on the same tree. The male flowers (staminate) are in small bundles (fascicles) and the female flowers occur on drooping stalk-like structures in clusters. They are greenish-yellow, without petals - inconspicuous, appearing in spring as the leaves begin to unfold. The fruits (samaras) occur in pairs of drooping clusters. They consist of a wing with a single seed at the base, are 1 - 1 1/2 inches long, and reddish brown to yellowish. They ripen in August through October and stay on the tree through winter. Box-elder wood is light-weight, soft, and not strong. It is used for low quality furniture, paper pulp, interior finishing, and barrel making. Syrup can be made from the sap. The seeds are a source of food for birds and mammals, and are important because they stay on the tree through winter, when other food resources are scarce.